Discussion in 'Indian Navy' started by desiman, Apr 20, 2010. 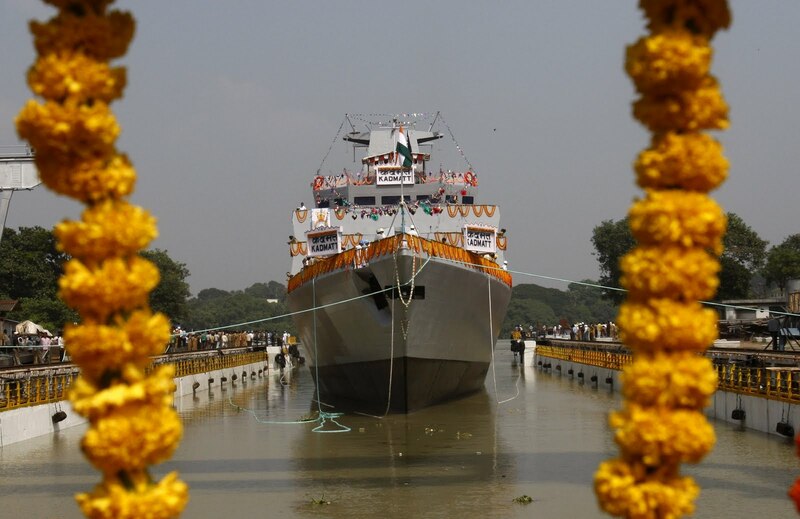 India's second indigenous Project 28 anti-submarine warfare corvette will be launched today by the Garden Reach Shipbuilders and Engineers (GRSE) in Kolkata. The ship is to be commissioned next year. 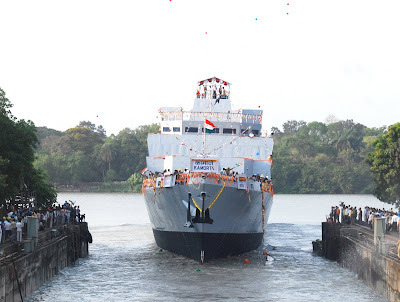 Its great to see a ship that is the first of its kind launched. Reminds me of the Daring T45 destroyer. 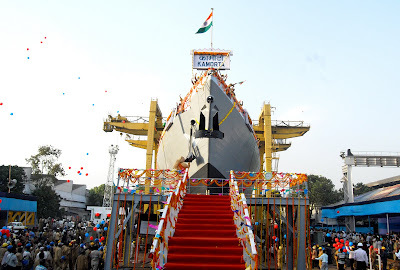 The Indian Navy's modernization quest under Project-28, to stealthily hunt and destroy lurking enemy submarines, was further bolstered today with the launch of the second indigenous anti-submarine warfare (ASW) corvette Kadmatt - named after an island in the Lakshwadeep archipelago of India -- built by Garden Reach Shipbuilders & Engineers (GRSE), at Kolkata. 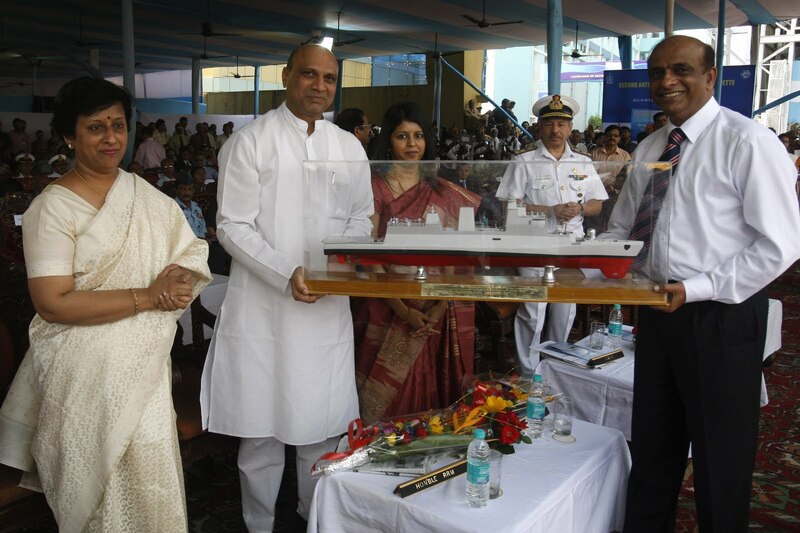 Conforming to the centuries-old maritime tradition of ship launches by a lady, Mamatha M, launched Kadmatt from the GRSE main yard in the presence of her husband, Minister of State for Defence M.M. Pallam Raju, Controller of Warship Production and Acquisition (CWP&A) of the Indian Navy Vice Admiral N.N. 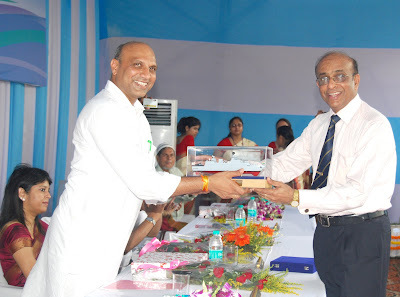 Kumar and GRSE Chairman and Managing Director (CMD) Rear Admiral K.C. Sekhar. 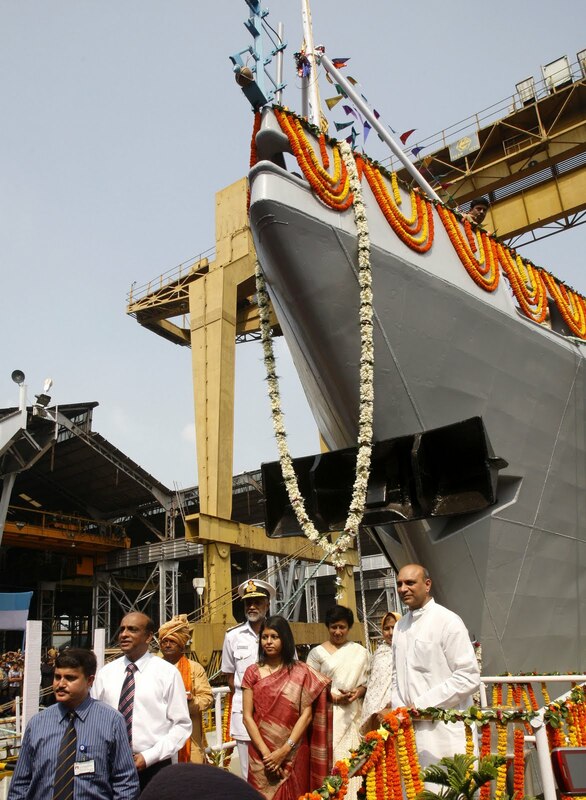 GRSE is slated to launch four P28 corvettes for the Indian Navy each costing nearly Rs 373-million. Kamorta, the first in the series was launched on April 19 last year. 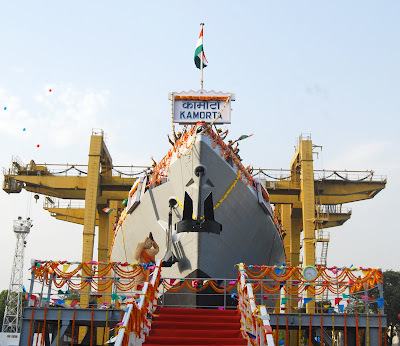 Kamorta, after fitments is expected to be delivered to the Indian Navy in June 2012 and Kadmatt in March 2013. The keel of the third ASW corvette meanwhile was laid in August 2010. The remaining two P28 corvettes scheduled to float out next from GRSE yards are Kiltan and Kavaratti. The Kamorta-class corvettes, with more than 80 percent indigenous content, are capable of fighting in a NBC (nuclear, biological and chemical) environment. The 109 metres long, 12.8 metres wide ship with an approximate displacement capacity of 3,000-tons can achieve a maximum speed of 25 knots. The ship powered by four 3888 KW diesel engines at 1,050 rpm has an endurance to cover nearly 3,450 nautical miles at 18 knots and can carry a helicopter on board. Each ship can accommodate 17 officers and 106 sailors. The anti-submarine warfare capability is largely achieved due to the low signature of radiated underwater noise. The ship having indigenous weapon and sensor suites is equipped with super-rapid gun mounting, anti-aircraft guns, torpedo launcher, rocket and chaff launchers. The ship fittings include early warning, navigation, fire control radars and under-water sensors with integrated communication and electronic warfare systems. The Minister, in his address, expressed delight that 50 percent of the total work on the frontline warship Kadmatt was completed prior to the launch as against 40 percent for the first ASW ship Kamorta launched in April, last year. "This is a record of sorts in the warship-building scenario," he said. 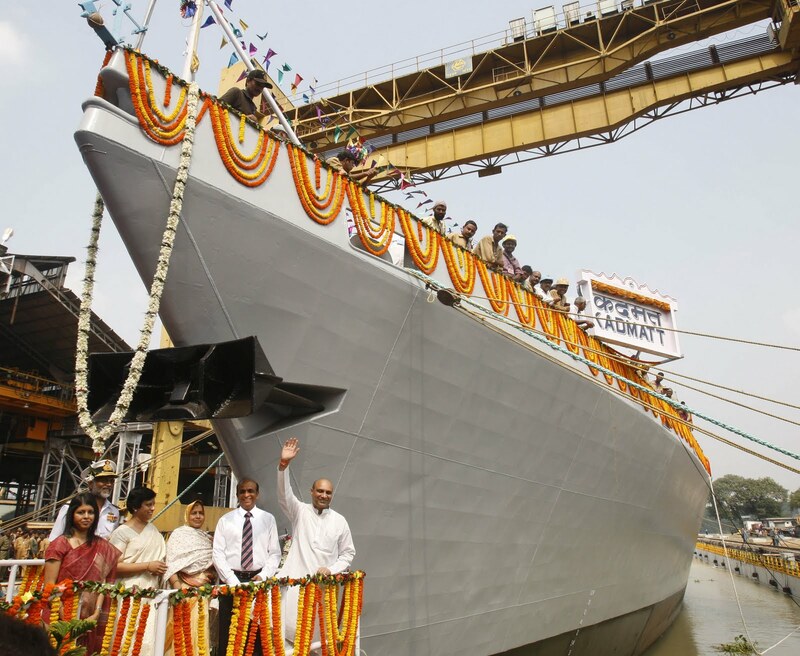 The on-schedule build programme would ensure timely contractual deliveries adding to the might of the country in its projection as a blue water navy of our region, he also said. Stating that the Indian Navy and Coast Guard have huge requirement of ships to be met without any time and cost overruns, Dr. Raju emphasized that timely delivery of 'quality ships' was the need of the hour. "Modern shipbuilding technology and tools must be adopted to achieve this objective," he stated. 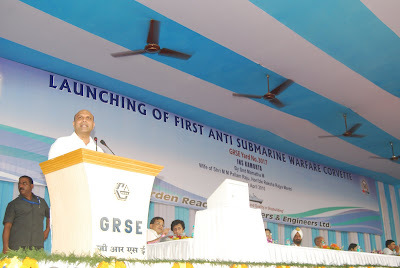 Urging GRSE to put into practice effective mechanisms to meet challenges posed by the Indian private sector, Dr. Raju said shipyards (defence) have to concentrate on implementation of time-tested quality practices, effective corporate strategy, establishment of reliable and stabilized vendors and most importantly, training and up-gradation of its human resources to the lowest level.